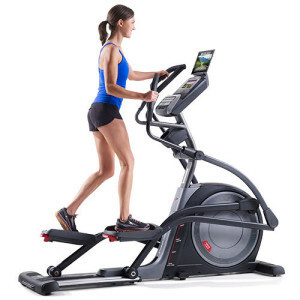 The ProForm PRO 12.0 NE Elliptical Trainer is On Sale! The ProForm PRO 12.0 elliptical trainer is the middle model in the PRO series. It offers some great value and may be the best fit for your needs and budget. The other machines in this line are the PRO 9.0 E and PRO 16.0 NE. 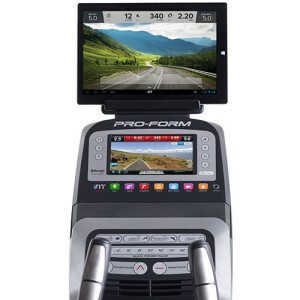 The ProForm PRO 12.0 is a durable machine that can offer an ergonomic workout with tech features that can help you reach your fitness goals. The ProForm PRO series comes from parent company Icon Fitness, which is the largest maker of fitness equipment in the world. They also construct the NordicTrack brand. Since they are such a huge company, they can often offer more innovative features and specs for a lower price. MID-WEEK SALE ENDS THURSDAY:The ProForm PRO 12.0 is OUT OF STOCK. Instead, check out the ProForm SMART Pro 12.9! 30 Lb. Flywheel — A heavy flywheel can contribute to a more natural and smooth motion on your elliptical. This model has a slightly smaller wheel (by 2lbs) than the PRO 16.0 NE, but with a savings of a few hundred bucks, you might not mind the difference. Full Color 7″ Touch Screen Android Browser Display — This vibrant touchscreen is found on Icon Fitness products. It provides you with easy-to-access workout stats and an Internet enabled screen for Netflix or web browsing. Tablet Holder — This may seem like a simple feature to rave about, but if you try balancing your tablet on a machine without a tablet holder, you will understand why we prefer to have a designated holder. Your tablet is too expensive to risk balancing on a console that is not designed to hold it. iFit Live Enabled— This technology allows you to simulate workouts in exotic locations like Paris, the Swiss Alps, or South America. You can customize your workouts with programs designed by certified trainers. Access your account online to track your workout stats and see your progress towards your goals. Use Google Maps to plan your routes while your machine adjusts speed and incline to match the actual terrain. The ONLY downside is this…iFit is only available if you are willing to pay the additional subscription fee. 32 Installed Workout Programs — The workouts are designed by certified personal trainers. This is a decent number of options to choose from. The PRO 16.0 NE model has 8 additional workouts. Multi-Grip Handlebars — The upper body grips allow you to workout your upper body along with your lower body. Speakers & iPod Input — Speakers are common on most machines in this price range and up, however you will find that ProForm speakers are better than most. The sound won’t match your home entertainment system, but it works well. Easy Assembly — Our team members have spent up to 2 hours assembling some ellipticals, so we were pleased with the easy set up for the PRO 12.0 NE. You can be exercising in a matter of minutes! Very Heavy Weight — This is a HEAVY machine. We don’t know the exact weight, but it is sturdy enough to provide a stable base for your workout. However, the downside to this is that it is difficult to move. Luckily, the front mounted wheels help with this. Consider the ‘indoor delivery’ option so you don’t need to struggle through the house to move the machine. Adjustable Foot Pedals — Adjustable pedals are great because they allow you to choose the setting that provides the most comfort for your body. Extensive Warranty —Lifetime Frame, 5 years parts, 2 years labor. This is a nice warranty, although the PRO 16.0 NE model has 6 years for the parts warranty. The ProForm PRO 12.0 model has many of the same great features as the other PRO models in this line. For about $500 less than the 16.0 NE you are still getting a sturdy machine, 7″ color touchscreen, iFit enabled console, and 32 workout programs. If you’re interested in a heavier flywheel and additional program options, check out the PRO 16.0 NE or NordicTrack E 16.9 machines. Overall, the ProForm PRo 12.0 is a nice middle option in this series.